Energy Efficient, Sustainable, Dependable Custom Metal Buildings | Lord Constructors — Lord Constructors, Inc. Located in California, this 18,000 sf custom metal building features a clear anodized facade and canopied entrance to the showroom, with red accent stripes surrounding the structure. It is protected with a standing seam roof, which is a raised seam metal roof designed to "float" in order to accommodate thermal expansion and contraction, offering generations of protection and durability. This transportation complex is comprised of a tilt-wall office building, 18,000 sf warehouse for high rack storage, a maintenance facility, and a 61 door cross-dock. Located in Las Vegas, it stands at 61,580 sf in size. Multiple skylights allow for natural lighting and increased energy efficiency. 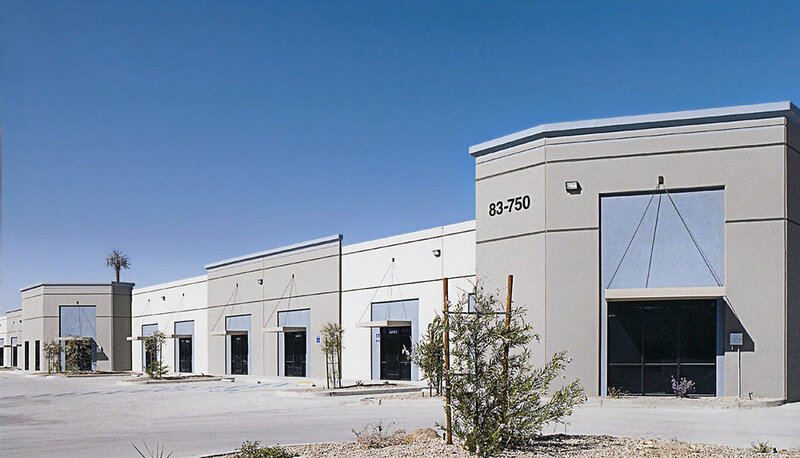 This equipment service facility includes a warehouse with a two-story office building. Its tilt-up concrete exterior has parapet walls, which conceal the view of the roof. The office features multiple windows for natural lighting and ornamental trellises at the entrances.